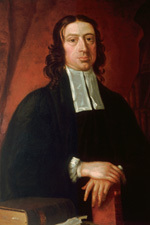 Publication of John Wesley’s letters began long before the Wesley Works Editorial Project was launched, and Frank Baker published the first two volumes devoted to Wesley’s letters (vols. 25–26, covering the years 1721–55). Careful readers of those volumes quickly discerned that Baker assigned some letters different dates or recipients than earlier editions. Moreover, there was a significant hiatus between Baker’s publication of vol. 26 and the recent release of vol. 27 under the editorial direction of Ted Campbell. In the intervening time some new letters from the years 1721–55 have come to light. Finally, it will be a while before all of the remaining volumes assigned to letters in The Bicentennial Edition are in print. For all of these reasons the two lists below will be of significant help to those who wish to study John Wesley’s correspondence. A list of all letters by John Wesley that either survive as original manuscripts or for which there are significant surviving excerpts or transcriptions of their content. Longer published letters are included (in blue font), with an indication of where they appear elsewhere in this edition. This list gives up-to-date details on holding locations for surviving manuscripts (often supplementing Baker’s annotation in volumes 25–26), and includes letters from 1721–55 that have come to light recently (shown in red font and planned to appear in an addendum to vol. 31). The list includes all known letters planned for inclusion in remaining volumes of this edition—if readers notice any omissions or mistakes, please let us know. Complete details on sources, short titles, and abbreviations used in the list can be found at the end of the file. A comparative listing of John Wesley letters included both in larger collections of his works and in volumes devoted solely to his correspondence. This comparison notes when letters are assigned different dates or recipients in various editions. It also highlights when letters are mistakenly duplicated in different settings within an edition. Finally, it helps to clarify at what point knowledge of the content of specific letters would have been available to the public. Complete details on sources, short titles, and abbreviations used in the list can be found at the end of the file.